There are three well-known ways of valuing the stock market that are based on publicly available information. Two are based on earnings: 1) The ratio of total stock market capitalization to gross national product (GNP). The market cap. to GNP ratio was popularized by Warren Buffet. 2) A cyclically adjusted PE ratio (typically a 10-year PE ratio). The 10-year PE was popularized by Robert Schiller (but not first proposed by him). The other ratio is Tobin’s Q, similar to a market price-to-book ratio. It measures the replacement cost of publicaly traded companies. Taken as a whole, where do these indicators stand? The total market capitalization of US stocks is approximately 15.5 trillion, as of the last trading day of the year. The GNP at the end of SEP 30 was 15.4 trillion. In other words, the Buffet ratio ratio is roughly 1. According to Buffet, that is average; he considers a ratio of around .75 to be a good deal. In his 2001 article when the ratio was 1.3, he suggested the market might return 7% annually over ten years (it yielded around 2%). Schiller publishes the 10-year PE ratio on his Web site. It is currently 21, in comparison to the historic average of 16.4. Again, the market seems to be overvalued, or at least no screaming deal. Finding values for Tobin’s Q is a bit more complicated. There is a Web site run by Smithers & Co. (an asset manager) that tracks it. According to that source, the market is roughly 33% overvalued (it was 29% overvalued on SEP 30). 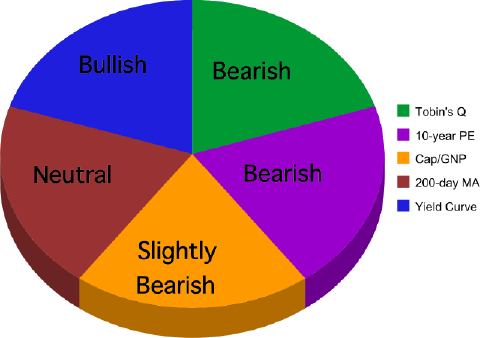 What other buy/sell signals are there for the market as a whole? Valuation indicators are bets on mean-reversion. What about betting on the trend? The market is just below its 200-day moving average. Nothing bullish there. There is one overwhelming bullish economic signal. The yield curve is substantially positive. A difference of more than 65 basis points between the 3-month and 10-year Treasury is bullish. The current spread is 187 basis points. But, that is because the 30-day Treasury yields virtually nothing. This is an economic indicator, rather a stock market indicator per se, although it is histocially correlated with bull markets. It probably stimulates the market because the world’s main investment choices are corporate and sovereign, and sovereign debt is expensive when rates are low. * PuraMed Bioscience (PMBS) has a “going concern” warning from its auditor, and has stated that it cannot continue business without raising money. Source: annual report. * The company has a track record of paying bills, such as those from consultants, by issuing large amounts of shares for as little as $0.15 per share. Source: annual report. * The company has marketed as an “independent study” a study of its main product, LipiGesic, that it funded. The CEO was one of the researchers. The CEO paid himself in shares for conducting the research on LipiGesic. Source: press releases and the company’s annual report. * LipiGesic is based on feverfew, which is a kind of daisy that anybody can grow. Yet, the company is trying to sell LipiGesic in packaging that only contains 6 doses for between $20-$30. Source: company site and Web searches. * Feverfew is associated with side-effects, including rebound headaches and miscarriages. The company doesn’t, or didn’t until recently, warn about side-effects. Source: Web research; company Web site. * The company is changing its Web presence in response to comments on the PMBS.OB Yahoo message board. * The vast majority of posts to the PMBS.OB board are from accounts that post almost nowhere else. Many of those accounts were created in the last few months, for the exclusive purpose of promoting the stock. …the Barron’s piece laid out an astonishing web of people “censured, barred or jailed by securities authorities for stock fraud” who have had, or still have, connections with Quigley Corp. The article ended with the kind of knowing comment Barron’s loves to issue: trading in Quigley stock was now under investigation by the Securities and Exchange Commission (SEC), so investors shouldn’t expect the stock to “levitate” forever. Specifically, Alpert reported that Raphael D. Bloom, a disbarred stockbroker convicted in 1989 of stock fraud, had introduced company Chairman and CEO Guy Quigley to a financial consulting and public relations firm called Diversified Corporate Consulting. The “managing member” of Diversified is William A. Calvo, III, a securities lawyer who was disbarred in Florida state court, and later in Federal Court, for his participation in a fraudulent public offering…..
Can you short penny stocks? Actually, some brokers allow it. The maintenance requirements are high, however.